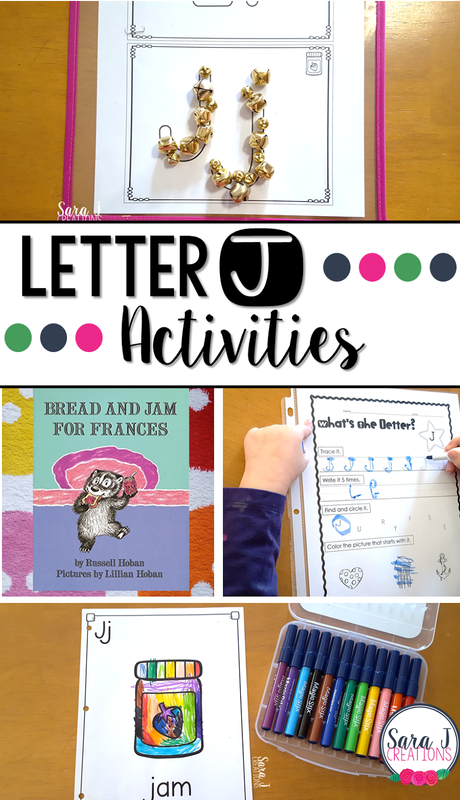 Preview: Letter J Activities that would be perfect for preschool or kindergarten. Art, fine motor, literacy and alphabet practice all rolled into Letter J fun. Up next in our weekly alphabet study is the letter J activities. We had some handwriting practice, literacy fun, art project and some review of all the letters we've learned. And we got to read one of my favorite books from when I was little. To start our study of the letter J and a week of fun activities, we read the book Bread and Jam for Frances by Russell Hoban. I can remember my mom reading us this one when we were little. We talked about how the word jam starts with J and that it is just like jelly, because that is what she kept calling it in the pictures. Then I showed my daughter what a J looked like in the book and we searched for other J's. I made sure to pick a book that matched the picture that we would create next for our alphabet art book. For the alphabet book we are working on, we added J is for Jam. We are still obsessed with our Magic Stix markers so we used those to color...of course like a rainbow. The alphabet book is part of my Alphabet Centers with Real Pictures. To practice writing the letter J, I put our alphabet tracing sheets in a reusable plastic sleeve and gave her a dry erase marker. She loves tracing them, but rarely will attempt to make the letter by herself. She also used our What's the Letter pages from our Alphabet Practice to do some more tracing practice. We also talked about the different pictures and what would start with the J sound. We practiced identifying the letter J in all different fonts with our J page from our Alphabet Centers pack. We went back to our favorite dot marker this week and she worked on this while I set up the next activity. I pulled out our mini playdoh mats from our Alphabet Centers and pulled some "jingle bells" out of our Christmas decorations. She worked on some fine motor practice by lining the bells up to make Js. We talked about how jingle starts with a J. To practice all of the letters we've learned so far, we pulled out some of our spin and cover games from our Alphabet Centers. These are so easy to set up and we take turns holding the spinner (pencil and paperclip) for each other.